Happy Boxing Day! Dan and I are hoping to hit the shops today to see if there are any good deals. It’ll be a good way to work off the turkey from yesterday’s dinner. Since I’ve been sharing some of my favourite travel Christmas memories, I thought I’d share one more to round out the series. This one is a bit of a cheat though, because it didn’t actually take place on Christmas day. 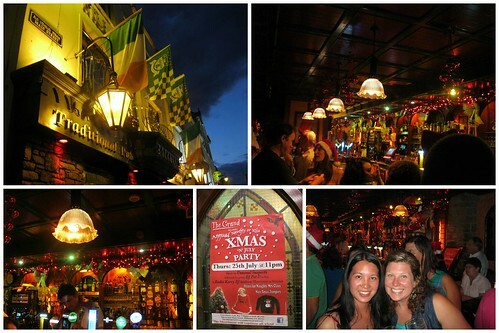 The Killarney Grand for Christmas in July. 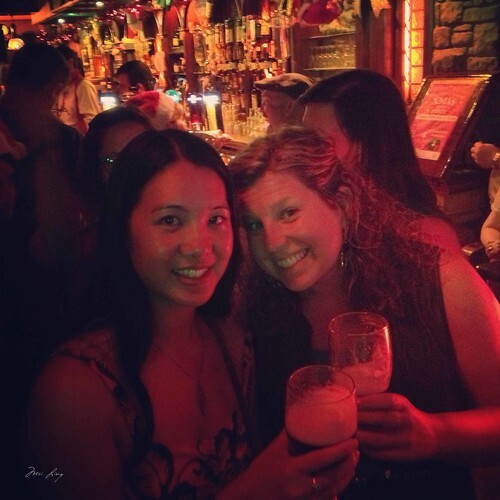 Kristen and I spent a week travelling together in Ireland in July 2013. We spent an incredible night in Killarney where there was a Christmas in July celebration taking place at The Killarney Grand. 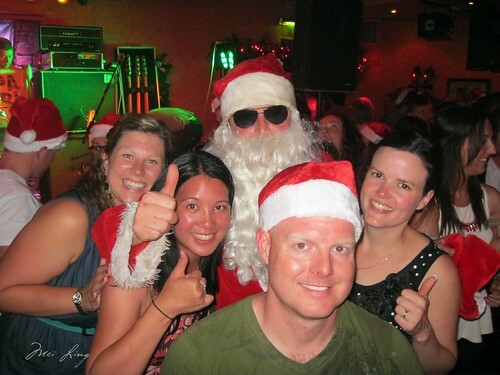 At first we were sceptical about Christmas in July, feeling that it was meant for tourists. We later discovered that it’s a common celebration in Ireland. Maybe we don’t do it as much in Canada because Canada Day is in July. Kristen and I celebrating Christmas in July. It was so much fun! We arrived a little later at The Killarney Grand and missed out on getting the free Christmas hats. 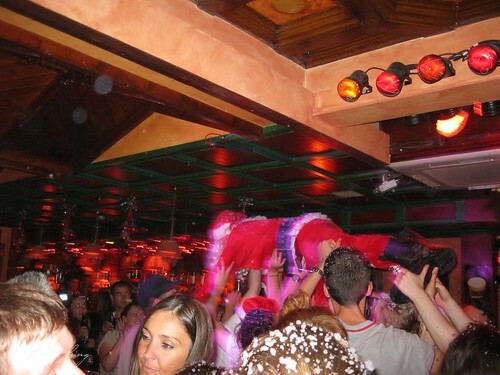 The atmosphere was festive and the pub was decorated. 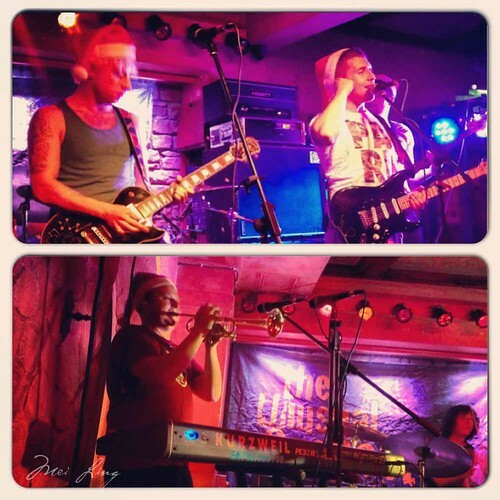 There was a live band called The Usual Suspects playing that night and they were amazing. 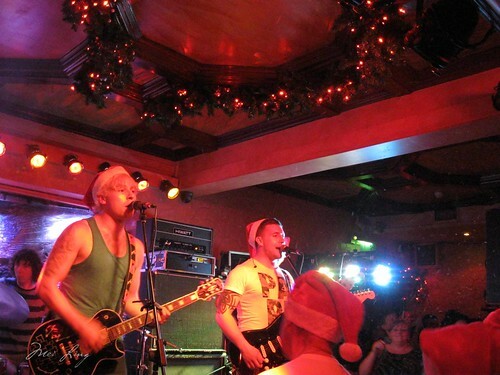 They played Christmas songs as well as covers of The Killers, Of Monsters and Men, Robbie Williams and more. We all sang along and danced and cheered. I can’t even describe the atmosphere. It was electric. At one point “snow” started floating down from the ceiling and we cheered some more. It all got into my hair and the next thing I knew people were taking pictures of me. After a while I realized the snow was actually some type of soap sud and that it had gotten into my beer. After that, every time it “snowed” everybody cheered but also made sure to cover their drinks with their hands. 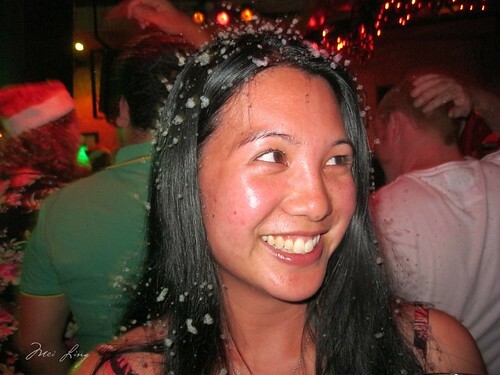 The “snow” showed up so well in my hair that a bunch of people took my picture. Eventually Santa Clause also showed up and we were able to take a picture with him. It was an incredibly fun night and we were all screaming “Merry Christmas!” at each other. I left the pub no longer a sceptic about Christmas in July. It’s cheesy, it’s irreverent but it’s fun and it was all in the Christmas spirit. If this is what Christmas in July is like then I’d definitely do it again! Thumbs up with Santa Clause!